(AP) LOS ANGELES - Duane Eleby, a suspected drug courier, was all set to sneak 10 pounds of cocaine through a security checkpoint at Los Angeles International Airport last February with the help of a former Transportation Security Administration employee and a screener. Eleby, however, bungled the plan by going to the wrong terminal and was arrested after another TSA screener found the cocaine, which set in motion a series of undercover operations that led to Wednesday's announcement that two former and current TSA employees had been indicted on federal drug trafficking and bribery charges. A 22-count indictment outlined five incidents where the TSA employees took payments of up to $2,400 to provide drug couriers unfettered access at LAX over a six-month period last year. In all, seven people are facing charges, including Eleby. "The allegations in this case describe a significant breakdown of the screening system through the conduct of individuals who placed greed above the nation's security needs," said U.S. Attorney Andre Birotte Jr. Among those arrested and charged are Naral Richardson, 30, of Los Angeles, who was fired by TSA for an unrelated matter in 2010 and accused of orchestrating the scheme; John Whitfield, 23, of Los Angeles, a current TSA screener; Joy White, 27, of Compton, who was terminated last year; and Capeline McKinney, 25, of Los Angeles, also a current screener. It wasn't immediately known if any of the four had retained attorneys. Authorities didn't say what post Richardson, who began working for TSA in 2002, once held. Eleby was given specific written instructions by White last February to ensure his safe passage through the airport, according to the indictment. Instead of going to Terminal 6 where White, who was hired six years ago, was located, Eleby went to Terminal 5 where his plane was scheduled to depart, authorities said. The plan, court documents show, was to have Eleby use a secure tunnel linking the two terminals after he was allowed through security by White. 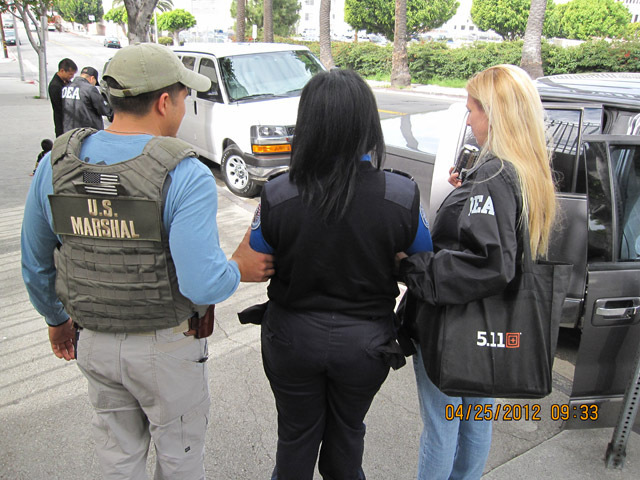 Despite Eleby's arrest, the smuggling scheme continued and federal agents set up a sting where informants were able to pass cocaine and methamphetamine through security checkpoints without further inspection. In one case, after nearly 8 pounds of meth went through an X-ray machine, Whitfield and an operative met in an airport bathroom where Whitfield was paid $600 for his efforts, court documents show. In another instance, McKinney let more than 44 pounds of cocaine pass through her security checkpoint, authorities said. None of the drugs ever made it to their final destination, authorities said. Randy Parsons, TSA's security director at LAX, said the agency is disappointed about the arrests but that it remained committed to holding its employees to the highest standards. If convicted, all four employees face a minimum of 10 years in federal prison. Whitfield, who has worked at TSA since 2008, and McKinney, a seven-year veteran, are under suspension, authorities said. There have been a handful of other arrests of TSA employees since the agency was created in response to the Sept. 11, 2001, terrorist attacks. Last week, former TSA officer Jonathan Best pleaded guilty to conspiracy to distribute and to possess with intent to distribute oxycodone for his role in a painkiller trafficking ring. Another former TSA officer, a former New York police officer and a former Florida state trooper have already pleaded guilty.